The HDD manufacturer Western Digital has introduced the WD PiDrive, a 314GB 2.5-inch hard drive with USB interface dedicated to be used with Raspberry Pi mini computers. This is the perfect choice for users that want to use RPi as a dedicated node for a crypto currency such as Bitcoin that already has about 65 GB of data for its blockchain. Finding a large and reliable storage solution for Raspberry Pi has not been an easy tasks as USB flash drives and SD cards do tend to wear out much faster than HDD and SSD drives and thus users are having issues with data reliability. 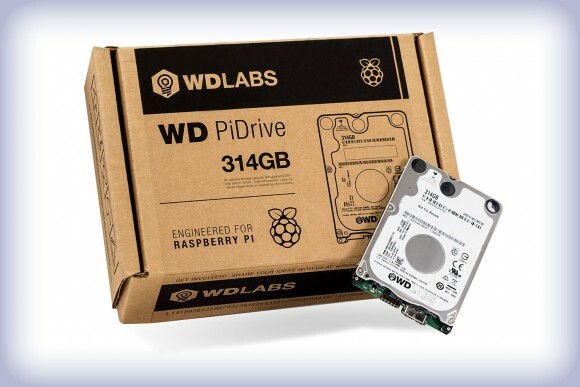 The WD PiDrive HDD for Raspberry Pi should easily solve the issues by providing large enough capacity for storing blockchain data as well as making sure your data will remain reliable for much longer time. The price is also affordable for such a solution, the WD PiDrive is currently being sold for $31.42 USD / 34.28 EURO, so while more expensive than a small SD flash drive or USB stick it is unmatched in terms of price compared to a large capacity SD or USB stick. We also like the naming of the device that is tied with the capacity it offers as well as the targeted platform, so it is all around PI.